Methods: We recruited patients hospitalized for an ACS at six medical centers in Central Massachusetts and Georgia (2011-2013). Participants self-reported three measures of religiosity - strength and comfort from religion, making petition prayers, and awareness of intercessory prayers for health. 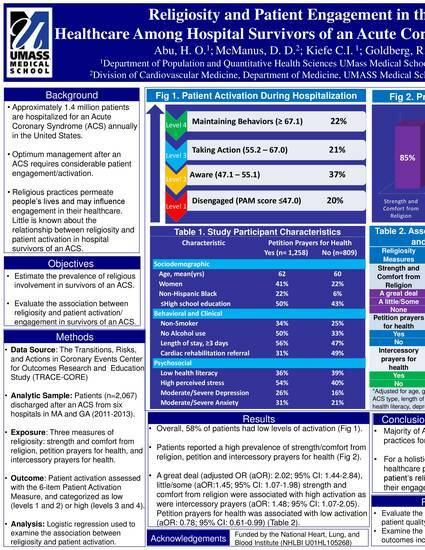 Patient activation was assessed using the 6-item Patient Activation Measure (PAM-6). We categorized participants as either having low (levels 1 and 2) or high (levels 3 and 4) activation in examining the association between religiosity and patient activation while adjusting for sociodemographic, psychosocial, and clinical variables. Results: Patients (n=2,067) were on average, 61 years old, 34% were women, and 81% were non-Hispanic White. Approximately 85% reported deriving strength and comfort from religion, two-thirds prayed for their health, and 89% received intercessions for their health. Overall, 57.5% had low activation. Reports of a great deal (aOR: 2.02; 95% CI: 1.44-2.84), and little/some (aOR: 1.45; 95% CI: 1.07-1.98) strength and comfort from religion were associated with high activation respectively, as was the receipt of intercessions (aOR: 1.48; 95% CI: 1.07-2.05). Praying for one's health was associated with low activation (aOR: 0.78; 95% CI: 0.61-0.99). Conclusion and Clinical Practice Implications: Patient activation was associated with religiosity, suggesting that healthcare providers may use this knowledge to enhance patient engagement in their care.